SAILING: Day Three at the 2012 Phuket King's Cup Regatta started with the traditional Sail Pass and royal gun salute in honour of the birthday of His Majesty the King of Thailand, followed by some very competitive racing in 15+ knots of wind gusting to 20. Day Three at the 2012 Phuket King's Cup Regatta started with the traditional Sail Pass and royal gun salute in honour of the birthday of His Majesty the King of Thailand, followed by some very competitive racing in 15+ knots of wind gusting to 20. 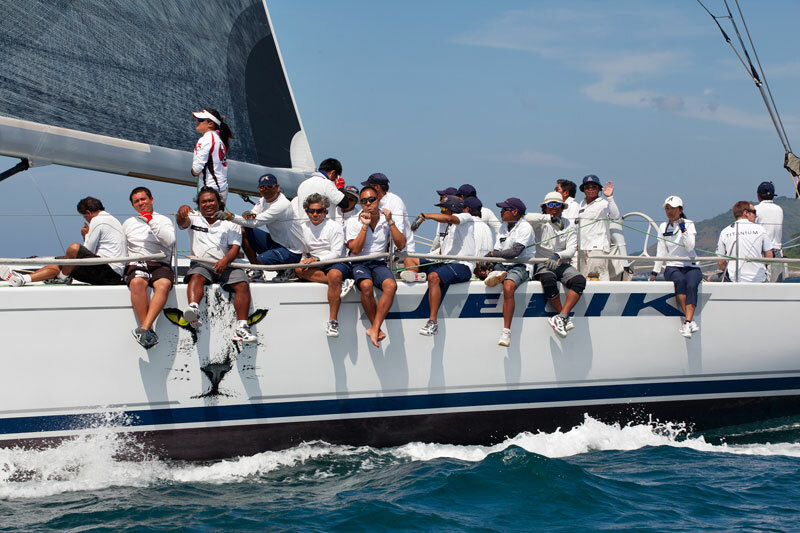 In IRC Zero class, Frank Pong and his Jelik team turned it up a gear today, winning races six and seven ahead of the Royal Malaysian Navy DK47 skippered by Mohamad Razali Mansor, and Kevin Whitcraft’s all-Thai team on the modified GP42 Won Marang. David Fuller’s Ichi Ban, one of two competing Ichi Ban teams this year, took a spectacularly tight win in IRC1, just one second on corrected time ahead of Walawala 2 team skippered by Steve Manning. The bottleneck finish illustrated just how close the class is this year, with potential winners coming from anywhere on the results sheet. In race seven, Foxy Lady 6, skippered by Bill Bremner, came home in first place. The class remains wide open. Royal Thai Navy 1 secured two victories in IRC2. Skipper CPO.1 Wiwat Poonpat inspired his crew to power home almost half a minute ahead of Matt Allen’s Ichi Ban team – very tough competitors in each and every race. The competition for Firefly 850 Sports class is shaping up between three teams; Hans Rahmann and Voodoo beat rival Dyer Straits skippered by Peter Dyer in race six, with the seventh race going to Roger Kingdon’s Moto Inzi – another very open contest. Fantasia, skippered by Andrew Stransky, returned to winning form in the Multihull class with a win in race six, while a new victor emerged in race seven, Sweet Chariot skippered by Mark Thornborrow. In Platu One Design class, Junichi Ishikawa and The Beaver came in ahead of compatriot teams Sakura and IPPAI, leaving Scott Duncanson’s Thai-registered Tuay Lek at the back of the pack. The second race honours also went to The Beaver, establishing their dominance in the one-design class. In the Premier class, Richard Dobbs’ Titania of Cowes won again in both races, solidifying his lead and putting him in good stead for back-to-back Regatta wins following their success last year. The Pine-Pacific team, Dobbs’ nearest rival in terms of outright pace, came in second place in race four, and in race five, a small time difference separated them from team Xena. Dobbs has the points score advantage, but margins of victory remain tight on corrected times. Of the Bareboat Charter entries, Aussie Graeme Sheldon became the man to break the Russian dominance in the class today with a strong win by him and his Agility International team. Mikhail Beloborodov on Tonicola 2 placed second, with compatriot Kirill Sakhattzev finishing third. However, Sakhattzev’s Sail Plane team came on strong in the next race, placing first for an important win. Barry Cunningham took Patrice III and crew to a Modern Classic class victory in both races today against some very stiff competition from Emerald Blue and Windstar; just a couple of minutes separated all three boats on corrected time. In Cruising Class, William Lo’s No Name romped home in first, seemingly without a challenge. This is doubtless the boat to beat among this group of cruising yachts. The team was victorious in race five also, setting the crew up for a solid Phuket King’s Cup Regatta trophy come end of the week. The final races for the Windsurfs took place today. Being re-introduced to the Regatta this year, the Windsurfing has certainly added some adrenalin-fuelled excitement to the proceedings. Chun Leung Michael Cheng took the overall win. Thai windsurfing stars Natthaphong Phonoppharat and Pornanan Payungkasem did their best to overturn the Hong Kong Olympian, but Cheng was ultimately victorious after a display of great windsurfing. His compatriot, Hei Man Chan, was the overall winner in the women’s class. The International Dinghy Classes also concluded today, with Thai sailors winning across the board. Pongsapat Poomyam won the Optimist Boys, while Kamonchanook Klahan was the Optimist Girls winner. Laser victory went to Kamolwan Chanyim, while Akapoj Kankaew finished first in the Topper contest. The three days so far have delivered spectacular tropical sailing conditions, and with two days to go, there is still plenty to compete for. Tomorrow is a Lay Day. Racing returns on Friday 7th December.